There will come a time where an employee in a particular organization will want to leave for to find other opportunities in his/her field of expertise or to venture in new ones. So in the event that it happens, they’ll be applying for different jobs that they might just be suited for. However, some of their prospective employers will want physical proof which shows much experience they have before they can even be accepted. Which is why a lot of resigning employees would want their employers to provide them with a job experience letter before they leave. This article will teach you all that you need to know about the job experience letter format and how you’ll go about in making one. 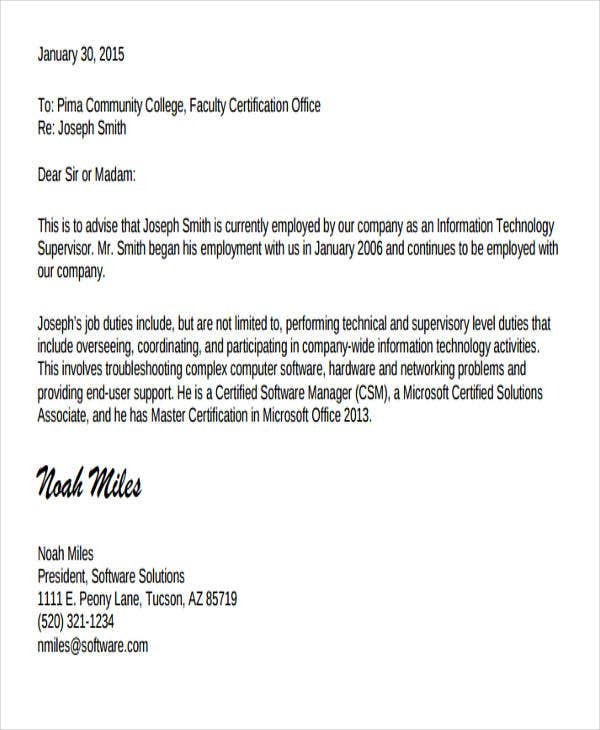 What Is a Job Experience Letter Format? 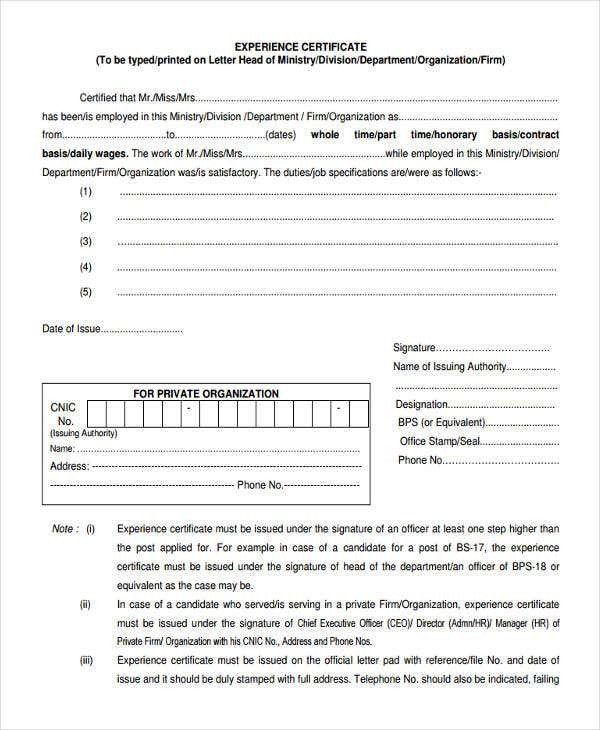 This is a very important document which is given by an employer to an employee in the event that an employee is relieved of his or her duties. The reason as to why this type of letter is very important for employees who are about to leave a particular organization is because it contains information which showcases the abilities and possibly event the accomplishments of the employee. This can help prospective employers understand what kind of employee they will be taking in if they decide to do so and it’ll help them validate whatever information is placed within the employee’s resume or curriculum vitae. How to Create a Job Experience Letter? 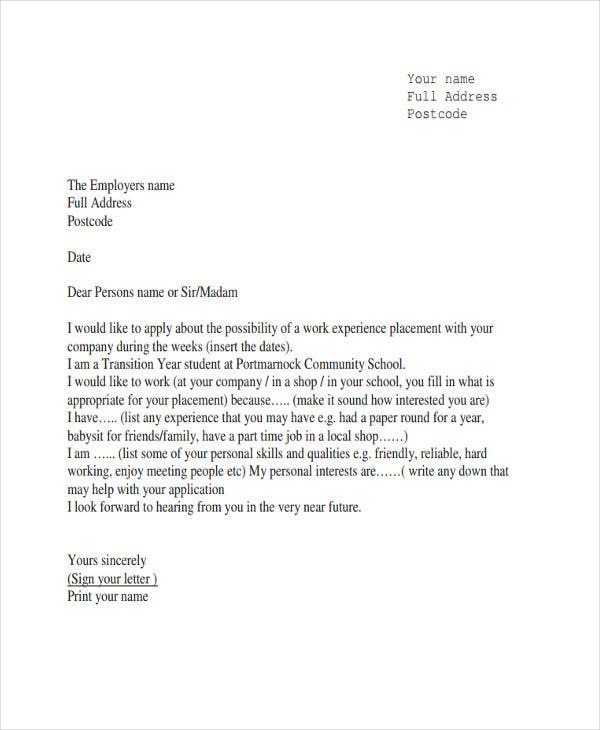 If you’re the employer and you’ve found yourself in a situation where an employee has to resign, then it’s best you know what a job experience letter should contain. It will require certain elements to ensure that the resigning employee’s next employer learns everything that he or she needs to in order to make the decision of hiring your resigning employee. You should never forget to write down the date in which you made the letter. This is because the prospective employer will want to verify if an applicant has already left his or her previous job or if he or she is currently still employed. The date alone can help provide that information which is why you’ll need to provide it. Be sure that you include the month, day, and year so that there’s no confusion as to when it was made. 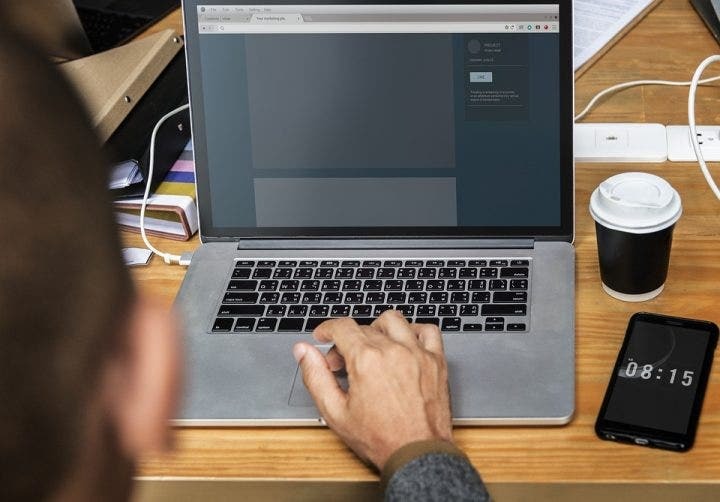 If a prospective employer had learned that an applicant already had a previous job, then it’s a given that he or she would want to verify whether the company is real or not. This is the reason as to why you’ll need to provide the complete name as well as address of the company that you work for or own. Be sure that you write down the complete name of the company so that the resigning employee’s prospective employer won’t have a hard time searching it online. Also, put in the complete address of your company or the branch that you’re situated in so that the prospective employer may be able to make a personal visit if he or she decides to do so. When making this letter, you’ll be thinking about the resigning employee’s prospective employer and what he or she would like to know about an applicant. However, you’ll have no way of knowing the names of all the employers that the employee will have to deal with when applying for a new job and there’s also no way for you to put in every single one of their names into the letter. Which is why one of the best options you can take is by simply putting in the words “To whom it may concern” into the letter. This way, you’ll be addressing any and every prospective employer that the employee will be going through when he or she decides to look for another career opportunity. This should be the main body of the letter. Here you will be talking about all of the different information that the prospective employer would want to learn about the employee that’s departing from your organization and applying to his or hers. The name of the employee – You have to make sure that you are able to provide the complete name so that the prospective employer will have an easier time in conducting a background check. Write down the employee’s first name, last name, and middle initial to make the search easier. The name of your company – Although this has already been stated at the very beginning of the letter, you’ll still have to write this again for the sake of formality. Always remember that you will have to write the complete name of the company so that the prospective employer will have an easier time whenever a background check has to be done. The term of employment – This is a piece of information that just about every prospective employer will need. They will want to verify just how long an applicant stayed in his or her previous job and that can only be done if you provide the term in which your former employee was working for you company. Make sure that you place both the date in which the employee was initially employed in your company and the date in which he or she officially resigned. Then you must place the actual amount of time that the employee has been working for you. This means that if the employee has stayed for a span of 2 years, then put that in the letter. The employee’s duties and responsibilities – This is the part of the letter where you’ll need to provide the prospective employer with information on what the employee was tasked with doing while he or she was employed in your company. List down all the relevant information such as what roles the employee played and what he or she fulfilled during his or her tenure. If you want, you can even add an extra statement as to how the employee performed while he or she was working for you. If you’re the employer in the situation, then you’ll have to provide the employee’s prospective employer with your information. Not that you’ll be handing out detailed information about yourself, but you’ll be giving just enough so that the prospective employer can verify as to whether or not the letter came from someone who had the authority to make it. So the only thing that you will need to provide is your complete name and your job title. 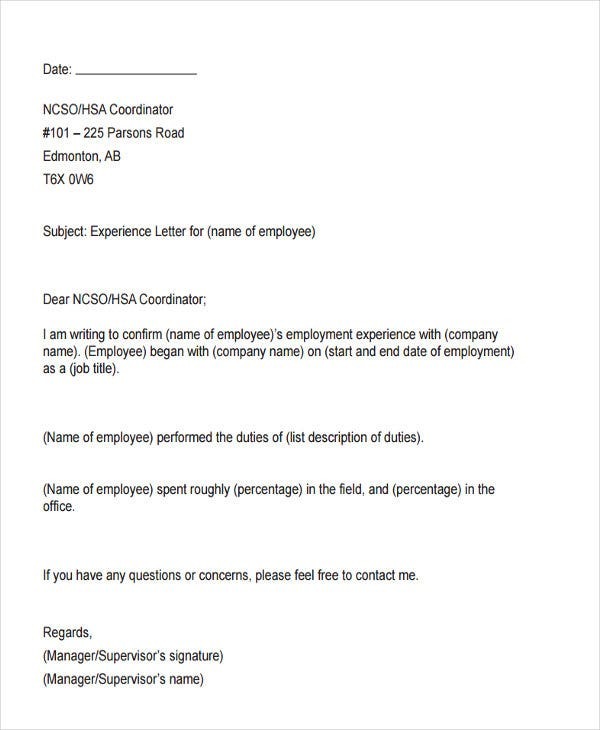 Again, just as if you were writing down your employee’s name into the letter, be sure that you provide your complete name. Also, include your signature once its all said and done so that the letter’s legitimacy cannot be denied. Now that you’ve learned what you should place in the letter, the next step is to ensure that you polish it enough to look decent for your resigning employee’s prospective employer. This type of letter should exude professionalism all the way until the end, which is why you’ll need to keep the tone of the letter polite at all times. You want to show the prospective employer that you’re someone who is taking the creation of this letter seriously and that can only be done if you’re handling it in a professional manner. If you’re going to show the resigning employee’s prospective employer about what the employee is capable of providing, then you should rule out in stating all the things that he or she is bad at. This means that you should never write down anything negative regarding the employee that’s about to leave the company. Doing so will lower the employee’s chances in acquiring another job and that’s definitely something that you would want to do. So if it’s an employee who has done a lot for your company, then focus on the good points and don’t think about adding anything negative when writing it in the letter. If you’re dealing with an employee that has caused you many problems, then you can always refuse to write a job experience letter or you can just state what his or her roles where without adding anything else beyond that. When you’ve written everything that you need to, then the last step would be for you to proofread and edit the job experience letter. The only thing that you have to make sure of is that there are no mistakes pertaining to grammar, spelling, and even the information about you, your company, and the employee. Go through the letter at least twice so that you can immediately spot and fix any errors that you may have missed. If you would like to learn about the other types of letters that you can make, then all you have to do is go through our site. It has all the different articles that contain the information which can help you. Just be sure that you go thoroughly through whatever they have to offer so that you can effectively utilize what you have been able to gather.